One is young and clear as glass. One is old(er) and soft tan leather. Both are Dickel Whisky. 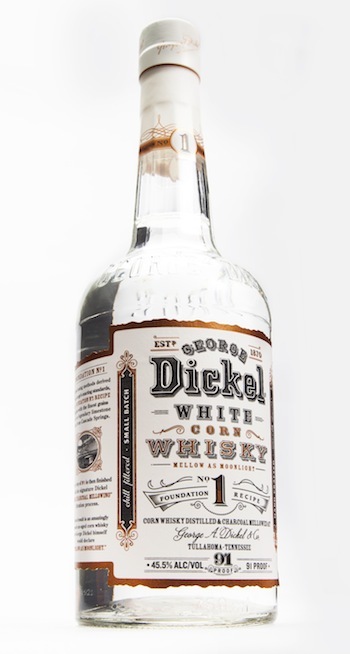 When the fine folks from George Dickel offered to share a sample of their new “White No. 1 Corn Whisky,” I asked that they (please) also send along a sample of their roughly ten year old Dickel Barrel Select so I could compare the two side by side. I’ve long been a fan of Dickel – especially after visiting their bucolic distillery in Cascade Hollow, Tennessee. And I like the fact that they tend to do things a little differently than most others out there – like calling their whiskey “whisky,” or actually doing something unique (charcoal filtering) with the sourced rye from Indiana that so many others are just bottling and branding as their own. You know what else is different about the Dickel White No. 1? It’s 91 proof, vs. the 80 proof that shows up in other big brand white whiskey (see Jim Beam’s Jacob’s Ghost). Also, it’s priced rather well at $22, vs. other ridiculously premium-priced unaged whiskey out there (see Jack Daniel’s Unaged Rye – $50!???) . So, how does the Dickel White No. 1 taste? Can you actually see the family resemblance between this youngster and its elder, the Barrel Select? On with the tasting notes and review. Like I said, this stuff is clear as glass, though clearly thicker than water. The nose is clean, but packs a ton of grain – you get the popcorn first, then a Sugar Smacks cereal rush, with a toasty malt depth in the background and an elusive bit of green corn silk and husk. It’s actually quite nice, though a far departure from the sweet heat that this will turn to after years in a barrel. Sipping neat, the corn/grain character continues, with some alcohol heat building through a long, lip-tingly finish. It makes for pleasant sipping, though I think it may be better served as the basis for creative cocktail making. Ice brings out some lush thickness in the whisky, but also seems to bring out a bit of that charcoal effect. It’s darn good for a white whiskey, and if I were more of a fan of white whiskey in general, I’d probably rate this higher – I just prefer the older stuff. 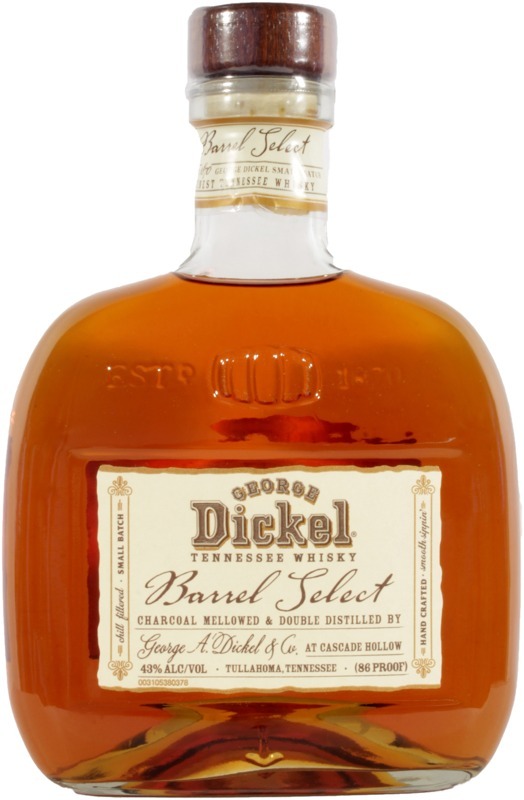 Dickel’s Barrel Select is a small batch of 10-12 barrels at a time, and 10-12 years old (though not with an age statement on the bottle). The nose here is beautiful, mellow, and balanced – you may get a tiny bit of that corn grain, but it’s well overshadowed (nicely so) by light brown sugar and lush tropical fruit and warm leather and toasty light wood. There’s so much textbook American whiskey stuff going on here, without any overbearing oak, I’m sorry I haven’t been drinking more of this over the years. Sipping neat, the first thing that stands out is the fruity character – ripe peach, simmering in a skillet with butter and brown sugar. It’s rich and full, and cinnamon spice starts to come out after a few seconds, along with warm vanilla. There’s a bit of green woodiness in the middle that knocks it down a tiny notch in my book, but the finish is long and pleasantly cinnamon hot. Damn good stuff, very nice for the price, worthy of a go for any bourbon fan. A cube of ice brings out the fruitiness on the nose even more, but also some syrupy sweetness. It dials down the green wood in the middle, but also slightly dulls the warm spice and vanilla. Again, I’d go neat rather than subject this one to ice, but that’s just personal preference. Do I see the family resemblance? Not so much, to tell you the truth. One is young and corn focused, the other achieves a beautiful balance of grain and oak and time. I appreciate that both the young Dickel and the elder Dickel have a smoothness to them that doesn’t detract from the flavor – so maybe that’s the Dickel profile, the impact of the charcoal mellowing. In any case, both are Tennessee goodness in a bottle. After all, Dickel’s for drinking. Full Disclosure: Both tasting samples were provided by George Dickel. Thank you for the review of the Dickel 1. I just noticed it on the shelf the other day and was thinking about buying it but was hesitant after trying more expensive white whiskeys and some were undrinkable and very much kerosene like so, being wary, I bought Jacob’s Ghost instead as I like Jacob’s very much which has a nice clean and pleasant taste. But in the future I will definitely try the Dickel 1. Where in Naples or Ft Meyers Fl can purchase #1? Have been #1 fan of #12 George Dickel going on 40 yrs. Can I find either the white or barrel select inL.A. [ lower Alabama]. Would love to compare,but will never give up my 90 proof.